Our guide to New Orleans will help you find the best bed and breakfasts in New Orleans Louisiana. New Orleans is synonymous with indulgence. Few American cities pack in so much food, music, nightlife, and history -- locals are passionate about it all. Culture is the city's calling card, and the best way to experience it is to dive right in. The spiritual heart of New Orleans is the French Quarter, where the city was settled by the French in 1718. You can easily spend several days visiting museums, shops, and eateries in this area. Yet the rest of the city's neighborhoods, radiating out from this focal point, also make for rewarding rambling. The mansion-lined streets of the Garden District and Uptown, the aboveground cemeteries that dot the city, and the open air along Lake Pontchartrain provide a nice balance to the frenzy of the Quarter. There are tons of great bed and breakfasts in the city of New Orleans, our city guide will help you find the best bed and breakfasts. You may have a hard time deciding what to do in New Orleans, but we make your decision easy. 2418 Magazine St, (504) 895-4302 - Nestled in one of the South's most historic neighborhoods, the Garden District Bed and Breakfast is a beautifully restored Victorian home. There are plenty more bed and breakfasts in New Orleans. 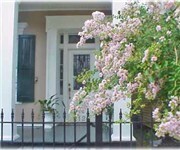 See all bed and breakfasts in New Orleans Louisiana.